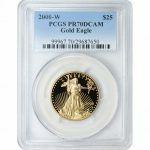 Gold American Eagles are sought by collectors and investors around the globe because of the innovative design and quality minting of the coin. As the official gold bullion coin of the United States, mintage levels are determined by demand from one year to the next. 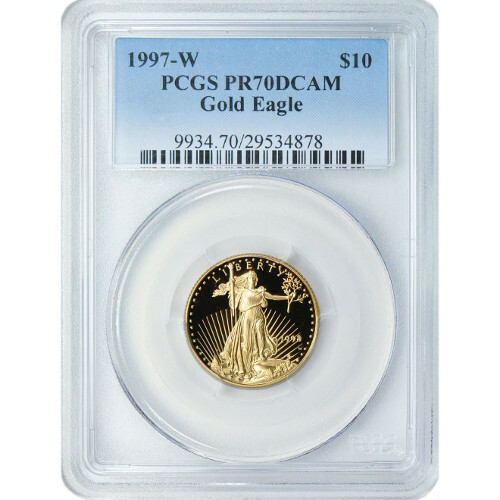 Today, you can purchase a 1997 1/4 oz Gold American Eagle with “W” mint mark and PR70 grading from the Professional Coin Grading Service through Silver.com. A PR70 graded coin is considered, by the PCGS, a perfectly struck proof coin with no marks or blemishes on its surface. The DCAM, or deep cameo, designation is achieved by striking a coin multiple times with a special coin die. The result is a proof coin with a strong, frosted design laid over a deeply mirrored, clear background field. Each of these coins bears a “W,” identifying it as a product of the West Point Mint. On the obverse side is Augustus Saint-Gauden’s depiction of Lady Liberty. Saint-Gaudens’ image was first used on a $20 gold coin commissioned by President Theodore Roosevelt in 1907. The reverse includes Miley Busiek’s family of nesting eagles. A well-known artist, Busiek was commissioned by the US Mint to create an image for Gold American Eagle coins. Congress laid the foundation for the US Mint’s creation with passage of the Coinage Act of 1792. The Mint is the only facility authorized to produce circulation currency for the federal government. Today, the mint also strikes all American Eagle coins as well as other collectibles like the America the Beautiful Series and many other. If you have questions about Gold American Eagles or other Silver.com products, please call us at 888-989-7223. You can also connect with us online using our live web chat service.